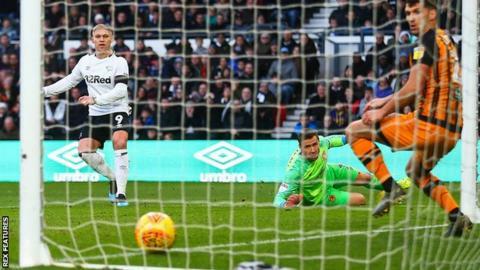 Derby County maintained their Championship promotion push with a comfortable victory over Hull City at Pride Park. Martyn Waghorn scored his 100th career goal just before the break, volleying in after his initial shot was saved by David Marshall, to put the Rams deservedly ahead. Fikayo Tomori had a great chance to double the lead early in the second half but nodded Harry Wilson's corner off target, before Waghorn made it 2-0 with a clinical finish. Hull created little going forward, their best opportunity falling to Kamil Grosicki inside 10 minutes, but the Poland international scuffed his shot wide. Grosicki almost turned provider midway through the second half with Jackson Irvine heading his cross inches past the post as Hull lacked any real cutting edge. Ex-England full-back Ashley Cole made his debut as a substitute for Derby, coming on for Waghorn in stoppage-time. Sixth-placed Bristol City's late victory at Blackburn means the Rams stay seventh, but they are only outside the play-off zone on goal difference. Derby have a chance to strengthen their promotion hopes this month with fixtures against struggling Ipswich and Millwall, before a visit to rivals Nottingham Forest on 25 February. Hull's own play-off ambitions have been dented in recent weeks, having picked up just four points from their past four games, leaving them seven points from the top six. Derby were good value for their 14th victory of the season, dominating possession throughout and could have won by a bigger margin had they been more clinical in front of goal. "It was a good win, a really good win against a good team, they've been beating pretty much everyone in their way over the past two months and we knew it would be a hard game. "We got a clean sheet and two really good goals, they had decent moments in the game but when we got the second goal it felt pretty comfortable. "We weren't at our best in the first half partly because of Hull being a threat, but when you're clinical like Martyn Waghorn was, it helps us to get our noses ahead. We've had games this season where we didn't get what we deserved." "Certainly the two goals are our own downfall, we have to win the tackle in the middle of the pitch and we knew their wide players would come in to penetrate for the sliding ball. "We've shown them video clips and worked on it on the training ground, so it's disappointing. The second one was poor defending. "Our defensive shape was right, we knew we wanted to play a counter-attacking game and our dynamic forwards would be to our strength, unfortunately when we did get the ball in the attacking third, the quality the players have shown wasn't there today."